The dinner is an interesting, fun and enjoyable experience, where all non-visual senses are exacerbated. The concept and venue is sophisticated, yet the feel is relaxed and casual. 10% of the net profits made by the restaurant are going to skills development projects for the visually impaired in Thailand. DID .. price of dining is not unreasonable for a typical 3 course meal in good quality environment and of course your enagaging in a unique experience, prices (pls check their website) from 700baht to 1200baht. 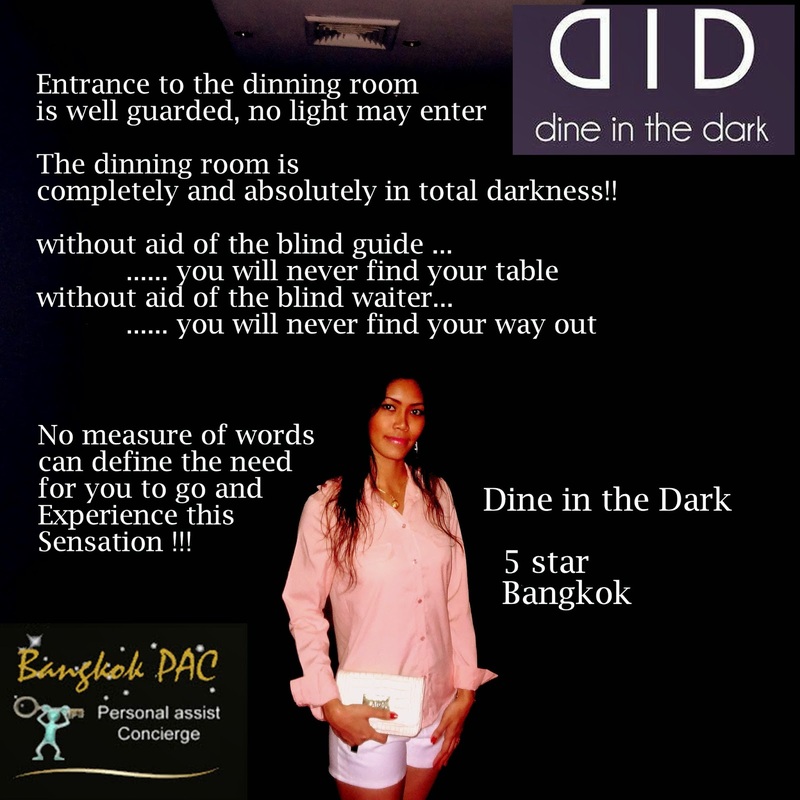 Many dark restaurants employ blind or visually impaired waiters and guides, whose condition enables them to work with little difficulty in darkened surroundings. Visually impaired staff may teach something of the techniques they themselves use in everyday life. centrally located in Bangkok with walkthru connection to BTS skytran station Asok. Try taking a bite of something with your eyes closed then identify it, it's easy to pretend but here's your chance to go live and be surprised by the outcome with "dark dining" phenomenon. Not just the taste but the whole experience that goes with support from visually imparied guides, providing a thoughtful combination of experiences; a window into a life without sight. Dark dining takes place in a dark restaurant, where the customers do not see the food they are eating. The basic concept is that the removal of vision enhances the other senses and increases gastronomic pleasure. Since 1999 such restaurants have opened in many parts of the world. "The guides are fantastic and the food was fragrant and fresh, providing a thoughtful combination of experiences; a window into a life without sight, and a sharpening of the senses required to fully appreciate dining." The three-course set menu is well priced and quite frankly it does not matter for the experience is priceless. Thailand ladyboys... how can you spot them? Thai Culture - The Heart Language - "Jai"